Sample the sweetness of fried plantains served with lime-kissed pork chops. Sway to the infectious rhythms of an outdoor salsa band. Savor the rush of caffeine from a shot of café con leche sold by a smiling vendor. 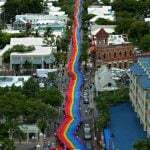 And as you do, breathe a fervent “thank you” for the Cuban heritage that enlivens and enhances Key West. 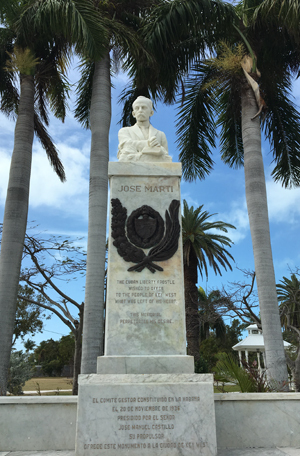 A monument to Cuban patriot Jose Marti stands in Key West’s Bayview Park. 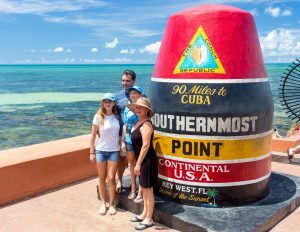 Key West is located just 90 miles from Cuba, and the two islands have a cultural connection that dates back almost 190 years. In the early 1830s, Cuban people began migrating to Key West in search of personal freedom — and among them were scores of skilled cigar-makers who quickly founded factories. The Cuban revolution that began in 1868 brought another wave of people to work in the flourishing cigar industry. By the mid- to late-1800s, Key West was known as the cigar manufacturing capital of the world. At the industry’s peak in the late 1800s, the island city was home to nearly 150 cigar factories — whose workers produced an astonishing 100 million hand-rolled cigars annually. But the cigar industry was not the only connection between Key West and Cuba. Many who lived on the island were fervent supporters of Cuba’s long fight for independence from Spain. 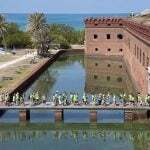 Cuban revolutionary leader José Marti rallied significant support for the cause in Key West, launching his drive for Cuba’s independence in a historic 1892 speech from the balcony of the San Carlos Institute at 516 Duval St. The San Carlos, founded in 1871 to preserve Cuban culture and promote the freedom of Cuba, currently operates as a museum, gallery, theater and popular venue for special events. 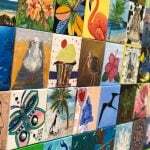 Other reminders of the historic Cuban influence can be found virtually all over Key West. Several former cigar factories still stand, as do many cottages where workers once lived. José Marti is recognized with a sculpture in the island’s Bayview Park. 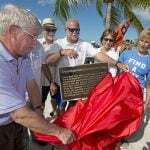 One of the most important monuments in the historic Key West Cemetery is the “U.S.S. Maine” memorial, dedicated to those who lost their lives when the battleship “Maine,” which sailed from Key West, blew up in Havana Harbor in 1898. A nearby monument is dedicated to those who died in an early Cuban uprising against Spain. 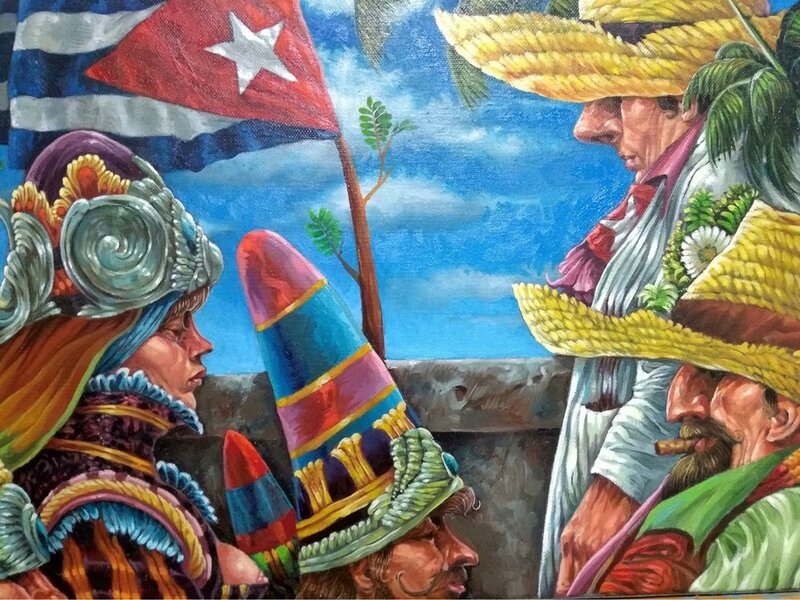 Many galleries and exhibits celebrate the work of Cuban artists — including “Visions of Cuba” on display at the historic Gato Cigar Factory at 1100 Simonton St. With a Feb. 1 grand opening, the exhibit features contemporary creations by more than 50 prominent Cuban artists who now live in locales around the world. 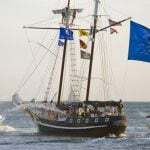 And the Mel Fisher Maritime Museum, located at 200 Greene St., recently unveiled an exhibit titled “With Little More Than the Shirts on Their Backs.” It features displays of personal items that Cuban balseros, or rafters, brought to the Florida Keys on chugs — handmade boats — on their treacherous ocean journeys to freedom. In addition the Mariana, a 21-foot makeshift vessel that carried 24 Cubans from their homeland to Key West in 2015, stands in the museum’s courtyard. As well as culture, the Cuban community brought Key West some of its most interesting and unique foods. The savory smells of ropa vieja, picadillo and other specialties drift from the city’s many Cuban restaurants, while other eateries offer Cuban bread and café con leche or the traditional Cuban Mix sandwich. 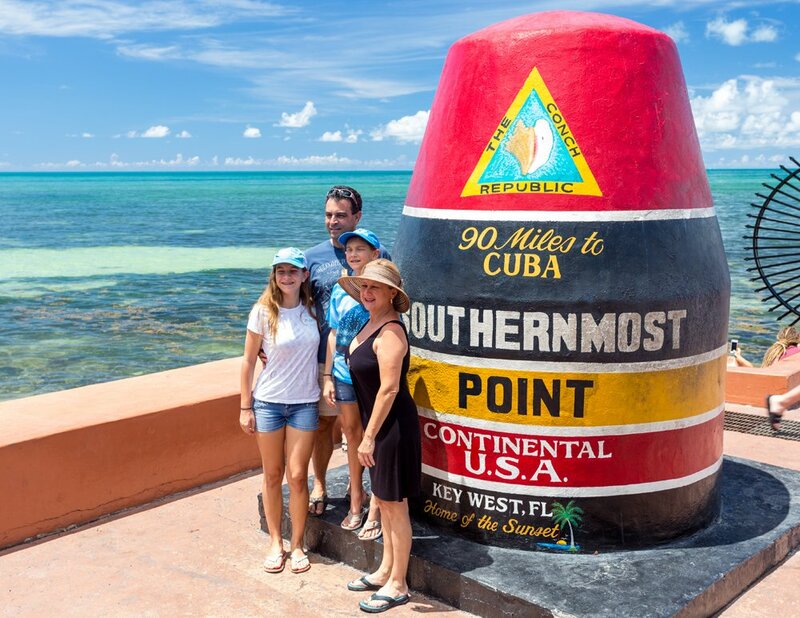 Cuba is often on visitors’ minds as they snap selfies at the red, black and yellow Southernmost Point marker. Why? Because the ungainly buoy replica marks the southernmost spot in the continental United States. Overlooking the Atlantic Ocean on Whitehead Street, its brightly-painted body bears lettering that proclaims it’s only 90 miles from Cuba. Although the buoy isn’t the loveliest site in Key West, it’s the perfect place to pause and salute the historic connection between the island and its neighbor across the water.